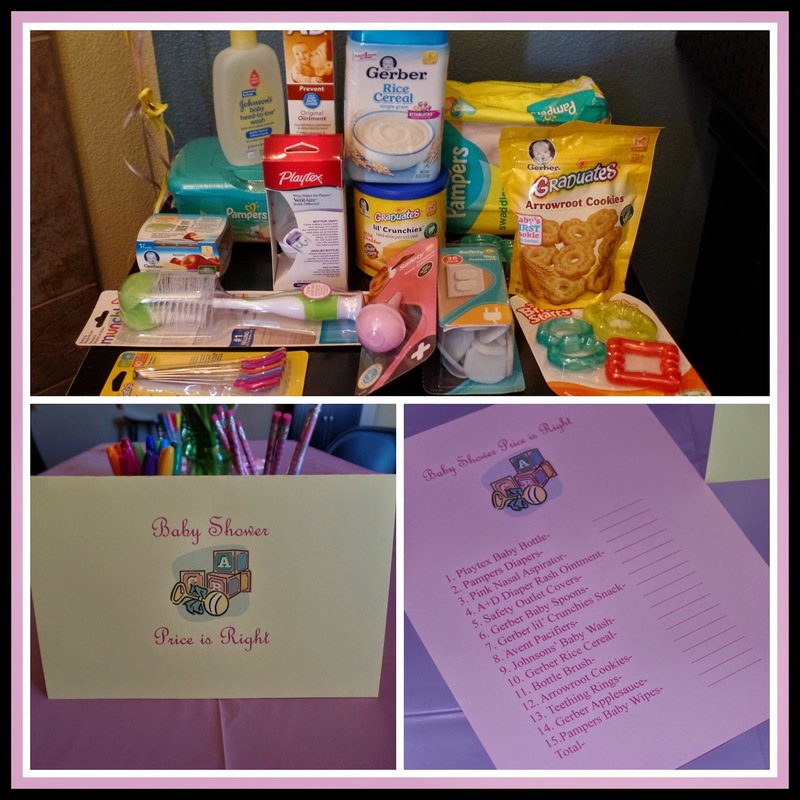 This past weekend I had the pleasure of hosting my little sister's baby shower. We are all excited to be welcoming a new baby to our family. It has been quite a few years since we have had a little one in the family, and I am super excited! 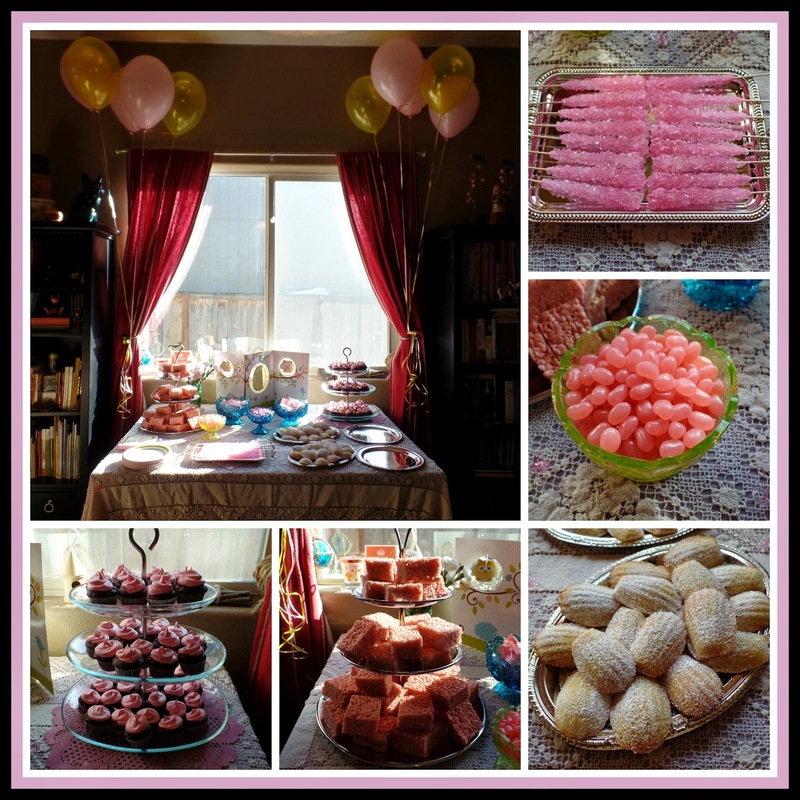 I had a really fun time planning her shower and thought I would share some of the activities, games, and foods that we had at the shower. Everything was decorated in light pink with touches of other pastel colors like yellow. 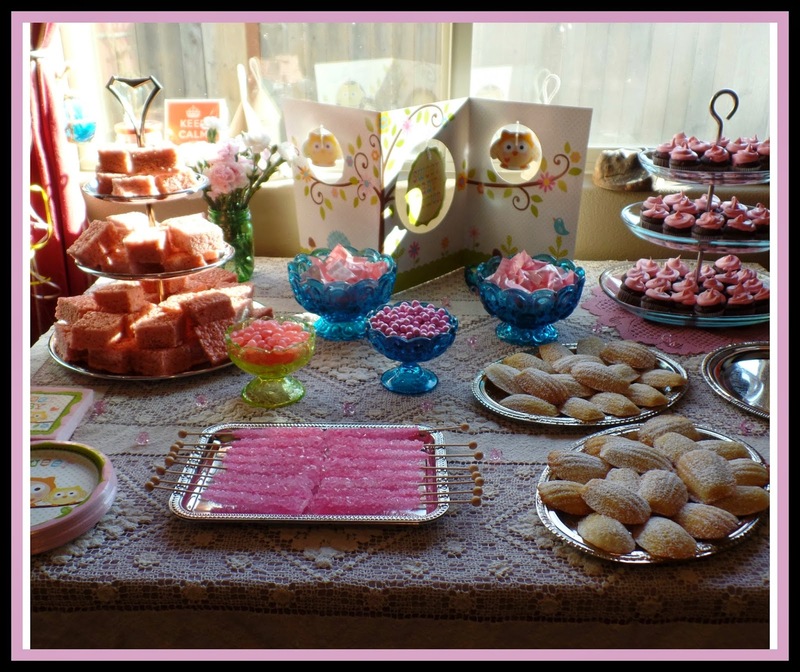 Since my sister is having a little girl I had fun making our dessert buffet very pink themed. Earlier this year I added to my turquoise moon and star glass collection, and they looked beautiful filled with all the pink candies. Most recently I added a tiny candle holder as well as a tooth pick holder that I used in the appetizer buffet to hold toothpicks. I just love old fashioned glass dishes! I went with an owl theme and found these cute decorations at Amazon. I also decorated with pink and white tulips and carnations which I arranged in my green mason jars for the different tables. I have a good sized mason jar collection now which is so useful for entertaining. 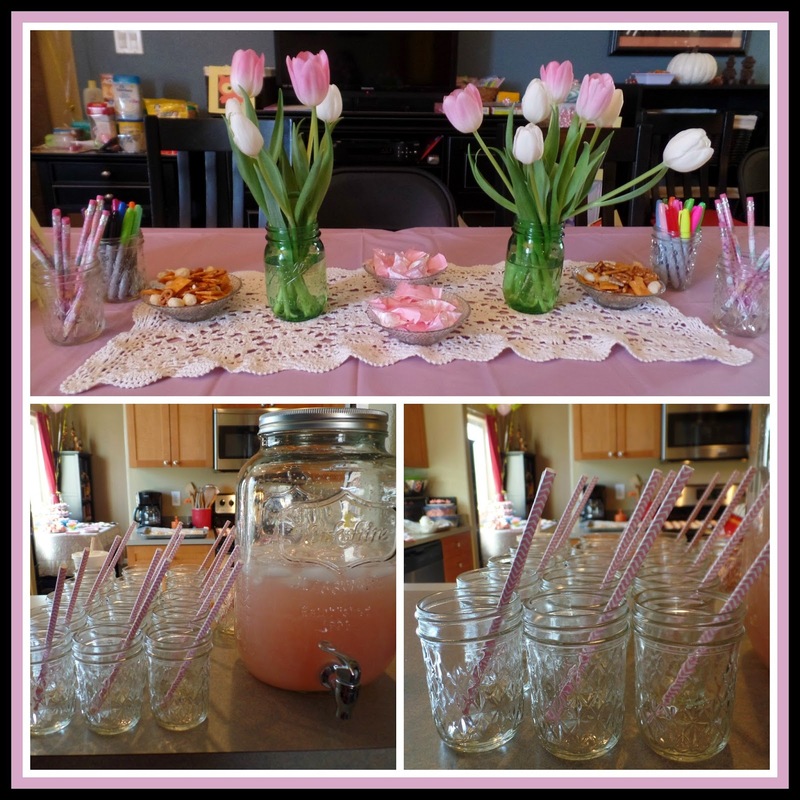 I used the mini glass jelly jars as drink cups, with pink striped paper straws. The jelly jars also were the perfect holders for the pencils and pens for our games and crafts. 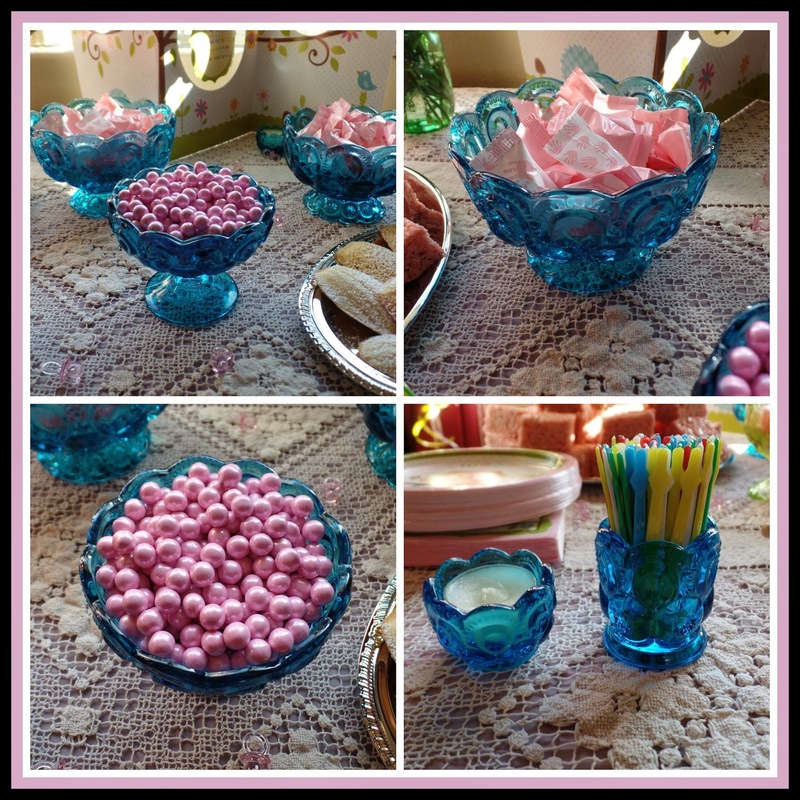 I set out little compote dishes with butter mints and cracker munchies at various tables as well. We had a very large turn out and my little house was happily full of people. Since I knew we would have a lot of people and table space was at a premium our activity had to be relatively simple. I searched on Pinterest and found many people had done diaper decorating for all of those night time diaper changes. So we all decorated a basket full of little diapers with art work, positive messages, and funny messages to encourage my sister and her hubby when they are changing diapers in the middle of the night. :) I set out an assortment of colorful sharpies and everyone had fun decorating the diapers. I found the owl printable for the basket label on Pinterest as well. Isn't Pinterest handy!! Of course one of the best parts of a baby shower is delicious appetizers. So I made a bunch of my favorite appetizers as well as a couple of salads to feed a crowd. 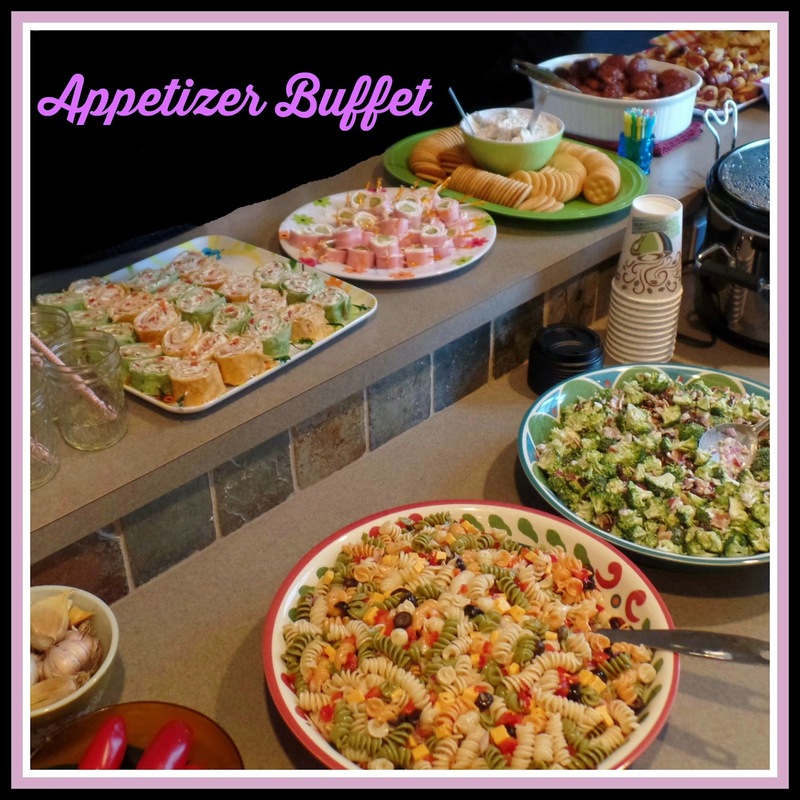 I made classic crescent wrapped li'l smokies, a family favorite ham and onion cream cheese cracker spread, sweet and sour meatballs, a broccoli bacon and raisin salad, classic bacon cheddar crescent pinwheels, and the other appetizers with recipes below. We had pink lemonade, a crock pot full of mulled hot cider with whipped cream and caramel to top it with, and of course hot coffee. 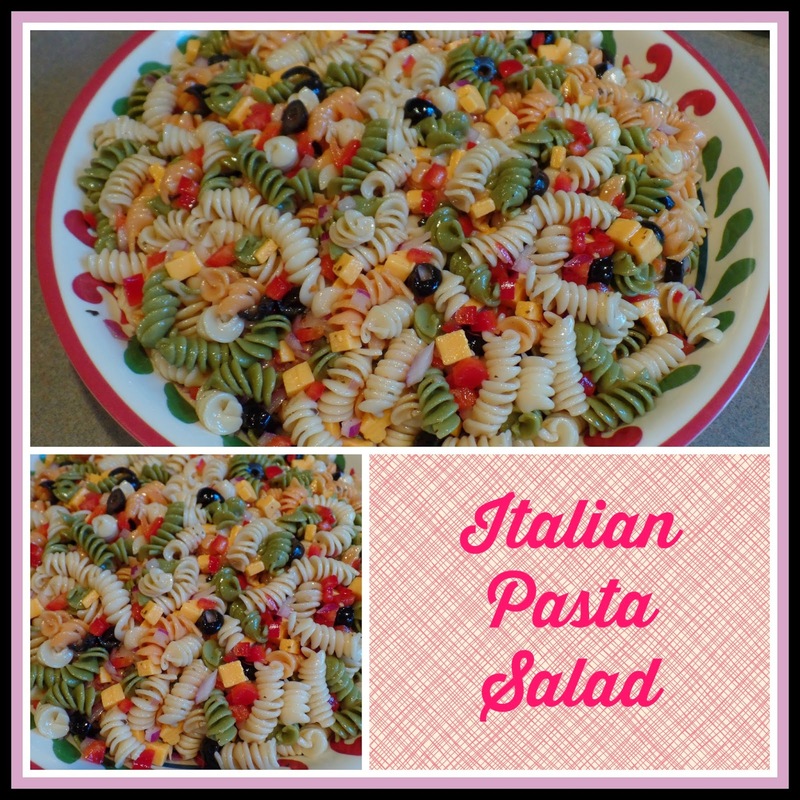 One of the salads I made was a very easy classic Italian Pasta Salad. Just cook and drain two boxes of colored rotini pasta (use one box for a smaller sized salad), then add two medium cans of sliced black olives, a finely chopped red onion, two diced red bell peppers, a small block of cheddar cheese cut into tiny cubes, and toss it all with a bottle of Italian Salad dressing. Then chill until you are ready to serve. This is such an easy recipe and is perfect for buffets and potlucks. The next appetizer I made was also one I made this past Halloween, and again, it is a classic recipe that always gets nibbled right up. I use the ham that is sliced and rectangle shaped. I thin out softened cream cheese by mixing in a little milk and a spoonful of mayo until it is soft enough to spread, but not so soft the cream cheese will smash out of the roll, use an electric mixer until the cream cheese is nice and smooth. 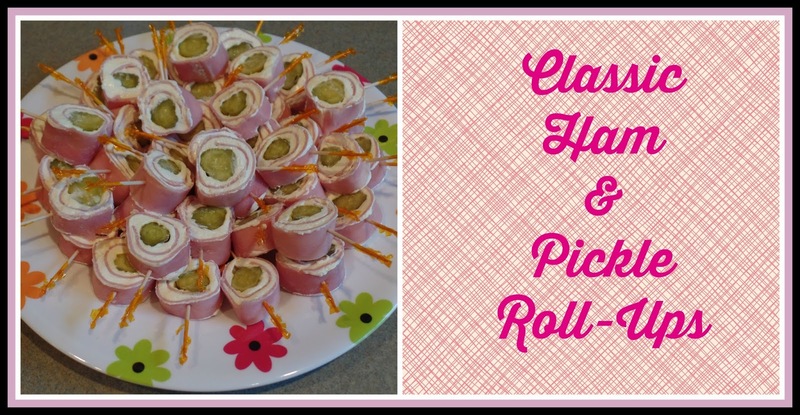 Then spread on a tiny layer of cream cheese, and at one end of the ham lay a mini dill pickle, or two, with the ends already cut off of the pickles, then roll up. I made all of the rolls and then chilled them in the fridge overnight before I sliced them so the cream cheese could harden a bit, it works best to chill them for at least a couple of hours. Then put toothpicks through the pickle roll at evenly spaced intervals and then slice through, making little rolls. Arrange on a plate like below. This is a nice appetizer since it can be made ahead of time. 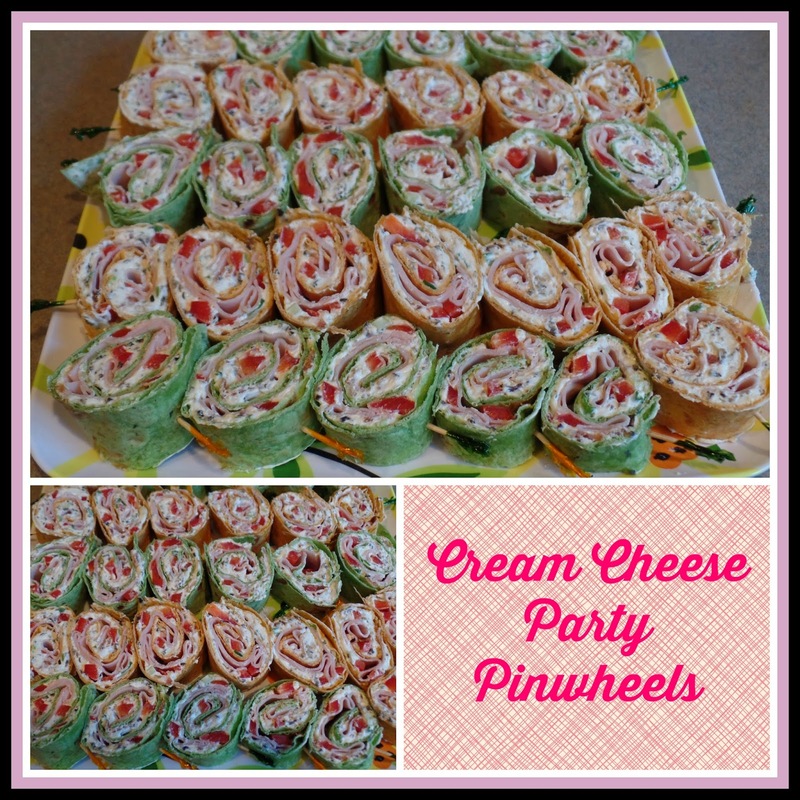 I have always wanted to make cream cheese wrap style pinwheel appetizers, but wasn't sure of a recipe. After browsing on Pinterest I found a bunch of yummy ideas for inspiration which I modified to come up with one I wanted. Leave last inch of wrap with only cream cheese mixture and no turkey or bell pepper to act as glue when wrapped. Place toothpicks about and inch or and inch and a half apart along wrap and slice. Arrange on plate and chill until party. We all had fun socializing, playing games, and eating. My sister got so many nice things for her new baby, it was fun picking out girly baby clothes! I can't wait to meet her! When everyone left I passed out little favor bags. 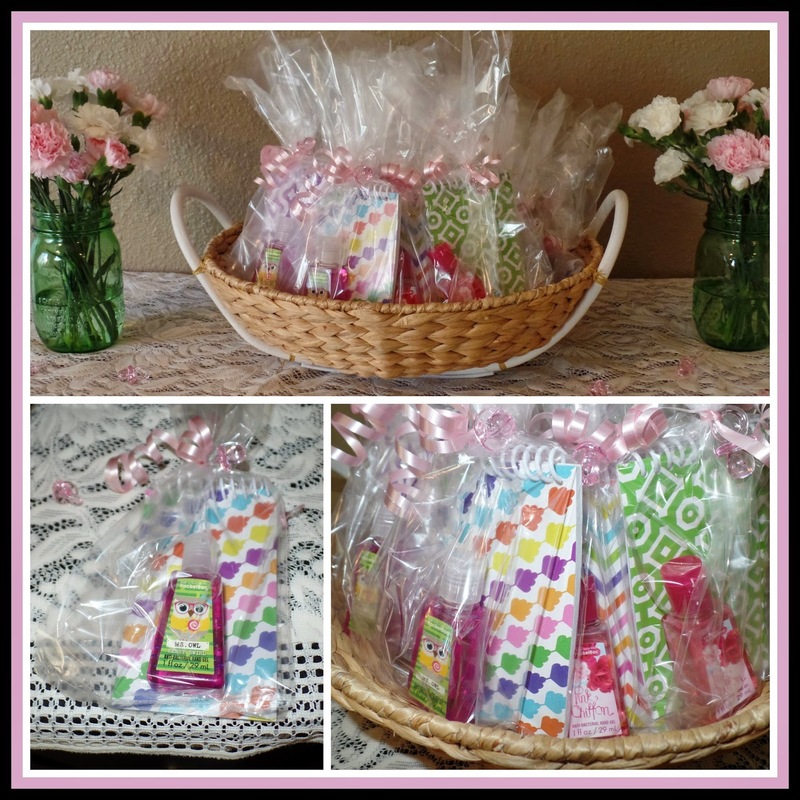 The favors were little Bath and Body Works Hand Sanitizers in different pink scents, including one which was perfect for our owl theme, Ms. Owl a berry scented hand sanitizer. I also included little colorful tablets, in a bag tied with pink ribbon and a little clear pink pacifier charm. Now that the shower is over I am gearing up for the holidays and am looking forward to all the festivities ahead! What a sweet shower! 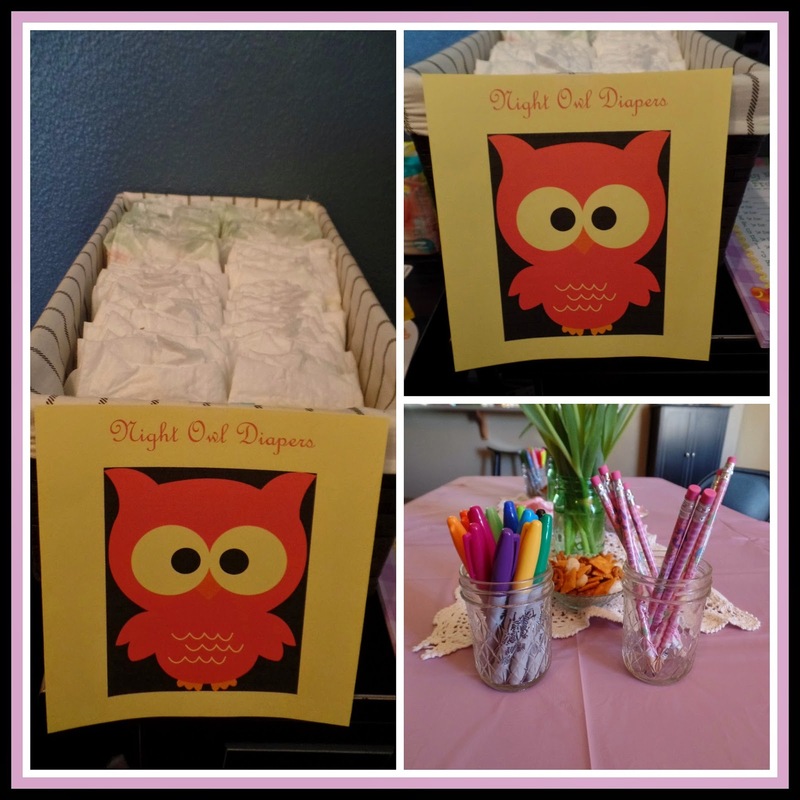 I love all of the pink and the Night Owl Diapers. Such cute ideas! What a great Baby Shower! 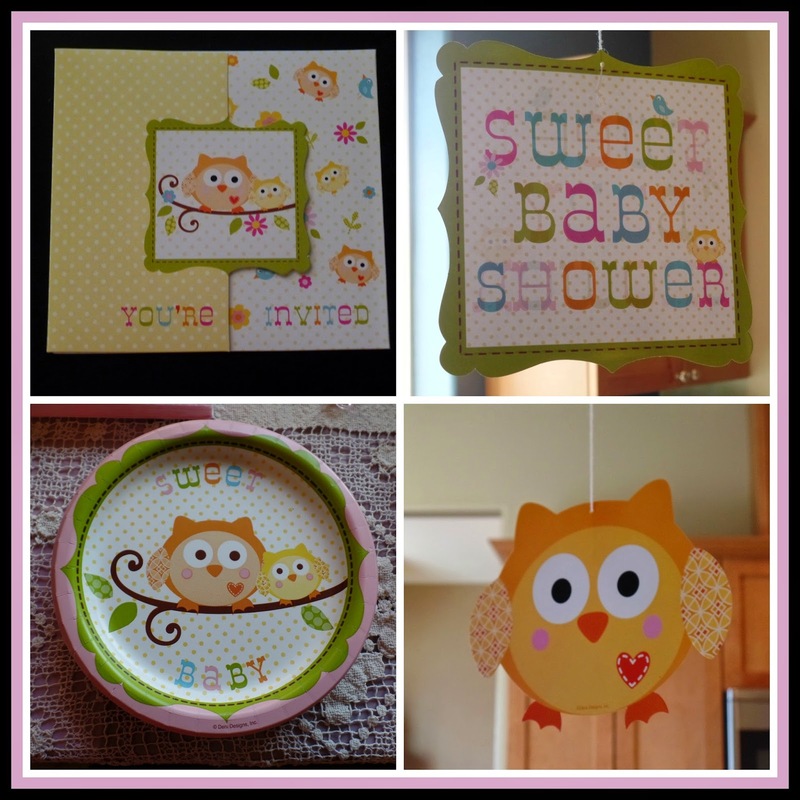 The food looks amazing and all the décor like the Night Owl Diapers, too adorable! I went to a boy's BS and it was lovely too. I couldn't take picks cause they are not family. Thank you for sharing, I'm gonna keep these fab ideas! Have a great weekend and congrats to your sis!